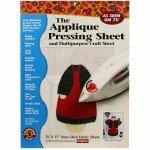 The Applique Pressing Sheet is for all fusible applique designs. Coated with Polylon the revolutionary non-stick surface. This double-sided sheet is made from an ultra high temperature fabric. Includes instructions for its multiple uses and a free applique pattern. This large 13 by 17 release all sheet is guaranteed for 5 years. Promotes even heat and keeps colors from bleeding together. Makes an easy to clean up work surface.